As a rule, I don't do book reviews. However, regular readers know that I am a big fan of trend following models and I use them extensively in my asset allocation work. 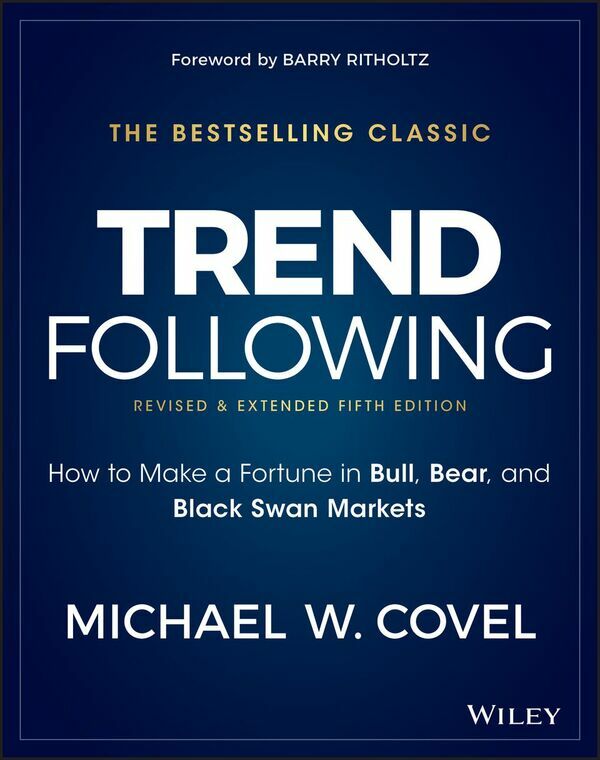 When a publicist offered a free review copy of Michael Covel's Trend Following, 5th Edition: How to Make a Fortune in Bull, Bear and Black Swan Markets, I jumped at the chance. At my firm, we use trend for tactical asset management. It takes everything above into account- not only the things, but people’s actual reaction to the things, a sort of realpolitik for markets. Will it always work? Doubtful. What is the downside when it doesn’t work? What is the expected benefit when it does? Is there a behavioral aspect to why it makes sense to include tactical in client portfolios? We think so. Not everyone would agree that this is worthwhile. After all that buildup, the book left me vaguely disappointed. 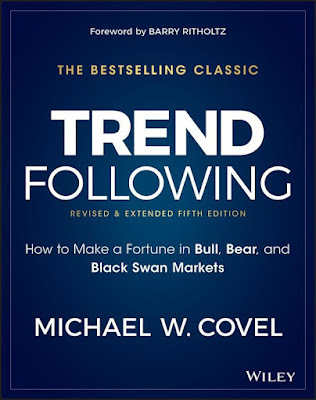 Covel's approach has been to be a cheerleader for traders who use trend following techniques without digging into the deeper issues that face investors. He treats trend following almost as a magic black box that everyone should use. 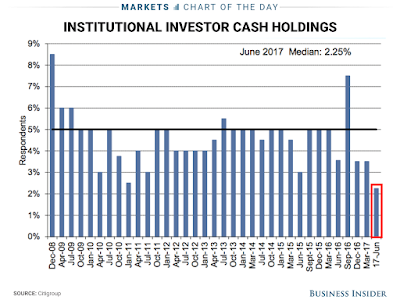 He doesn't take the next step to discuss the characteristics of this class of strategies, which sophisticated investors think about when they consider the use of such techniques have a place in their portfolio. It is said that no one rings a bell at the market top, but a review of sector leadership shows that late cycle inflation hedge sectors are poised to assume the mantle of market leadership (see Nearing the terminal phase of this equity bull), which would be the signal for a blow-off in inflationary expectations. Such an event would be the trigger for the Fed to become more aggressive in its rate normalization policy, and raises the risk of a policy mistake that could push the economy into recession. If investors are looking for a bell to ring at the top, then there are signs that someone is slowly ascending the bell tower. Consider the Relative Rotation Graphs, or RRG chart, of the market today. As an explanation, RRG charts are a way of depicting the changes in leadership in different groups, such as sectors, countries or regions, or market factors. The charts are organized into four quadrants. The typical group rotation pattern occurs in a clockwise fashion. Leading groups (top right) deteriorate to weakening groups (bottom right), which then rotates to lagging groups (bottom left), which changes to improving groups (top left), and finally completes the cycle by improving to leading groups (top right) again. Wayne Gretzky famously said that his secret was to skate where the puck is going to be. 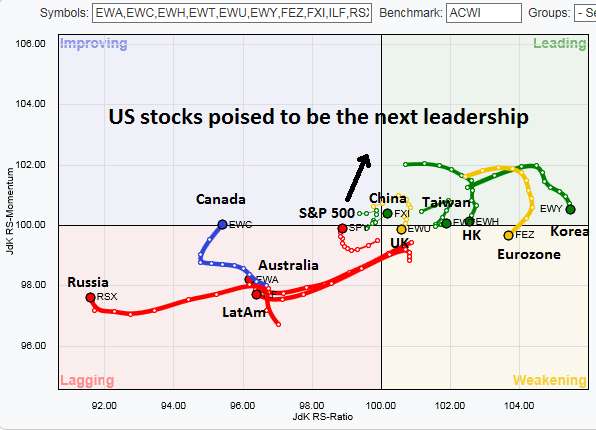 Using that principle, the top left hand quadrant shows the sectors that are the likely emerging market leadership. These groups, with the exception of Financial stocks, are all in the inflation hedge and resource extraction industries, namely Energy, Metals and Mining, and Materials. In short, the message from the evolution of sector leadership indicates that the market is poised for a blow-off in inflationary expectations, which will likely prompt a response from the Fed. Mid-week market update: Subscribers received an email update of the tactically fragile environment for US equities on Monday. There are plenty of reasons to be cautious. 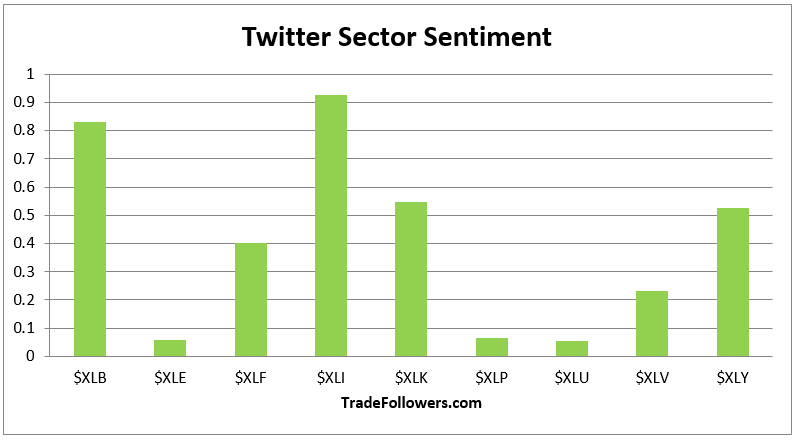 Last week, sector sentiment gleaned from the Twitter stream had every sector positive. When this occurs a short term market top materializes usually within the following week. 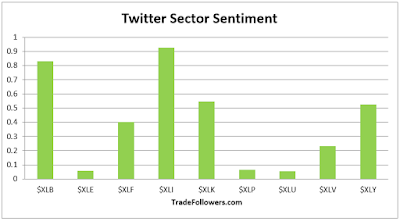 Once in a while, the sectors will paint another week with all of them in positive territory, then the top comes. Basically, when every sector is being bought aggressively it signals that the market is overbought. That`s the just first warning. There are more. As the FOMC meets this week, one key question for Fed policy makers is, "How tight is the labor market?" A related question is, "In the face of tame inflation statistics, when are we going to see evidence of rising wage growth?" The Federal Reserve is likely to stand pat on policy when it concludes a two-day meeting next week, but it faces a debate about the future path of interest-rate increases because of a deepening puzzle over inflation. Officials will likely leave short-term rates unchanged and wait until September before announcing plans to slowly shrink their $4.5 trillion portfolio of bonds and other assets. They face a dilemma, however, because the two sets of economic indicators they most closely monitor are sending conflicting signals about the urgency of additional rate increases. The unemployment rate, which hit a 16-year low in May, shows labor markets are tightening. That argues for the Fed to keep lifting interest rates to prevent the economy from overheating. But inflation is drifting away from the central bank’s 2% target, suggesting borrowing costs should stay low to strengthen price pressures. 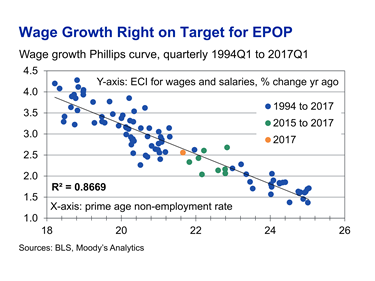 I recently highlighted analysis from Adam Ozimek of Moody's Analytics showing that there is no wage growth mystery. 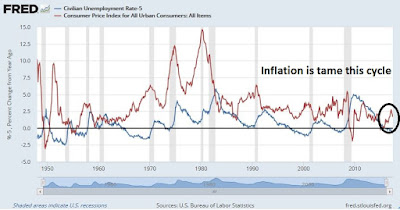 Ozimek found that the Phillips Curve, which postulates a trade-off between unemployment and inflation, is alive and well once he substituted the prime age non-employment rate for the unemployment rate (also see my recent post In search of the elusive inflation surge). Using this analytical framework, the Fed is on the right track in normalizing monetary policy. Additional data indicates that the labor market is tighter than the market consensus, and a rise in inflation is just around the corner. Being a contrarian is a lonely life. You don't hang out with the popular kids. You are probably the nerd in the class. You get picked last in team sports. You don't get invited to any of the parties. And even if you do, everyone laughs at you. 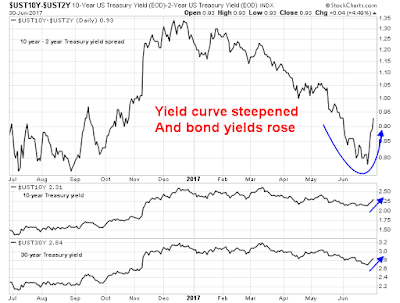 Over at Macro Man, he put us in a contrarian state of mind by asking, "What's the unloved asset class?" The question was not in the context of a trade, such as short FAANG, but an asset class that you buy and hold for the next few years. Going down the list, he rejected US equities for the reasons of high valuation. He also rejected developed market fixed income, as well as all forms of credit. 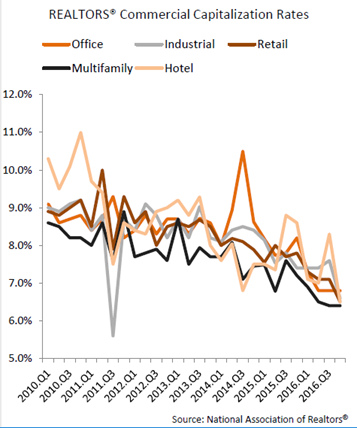 The cap rates on commercial real estate isn't offering great value either. Private equity? Just look at the cash on the sidelines waiting for deals. At the end, he concluded, "Hmm, cash and gold seem to check a lot of boxes." No wonder contrarians don't get invited to parties. Cash? Gold? While I believe that it's still a little early to get overly bearish on equities, but here is how a scenario that favors cash, gold and other commodities may develop. Chinese offshore property stampede: Start of a trend? 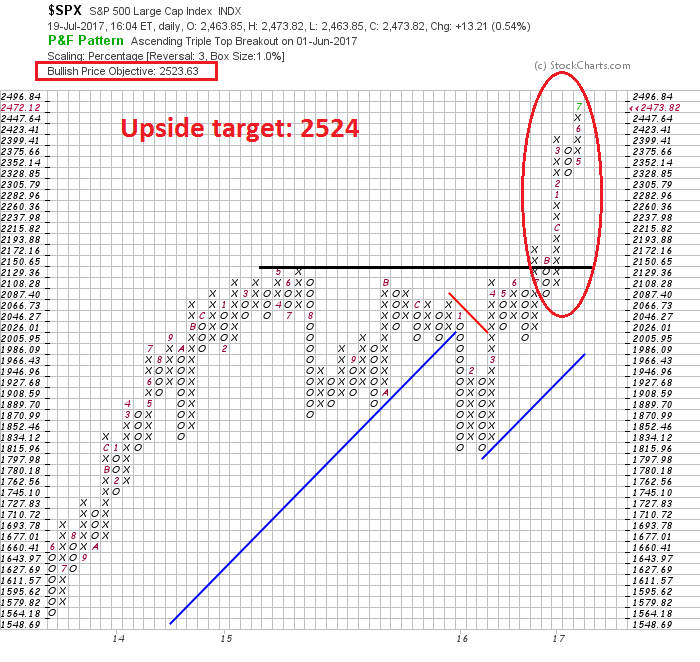 What's the upside target in this rally? Mid-week market update: As the major US equity indices reach fresh all-time highs, it is time to ponder the question of how far the current upleg is likely to carry us. While technical analysts have several techniques available at their fingertips, I rely mostly on the venerable point and figure charting system (click link for primer), which was first used in the late 19th Century, to determine upside targets. 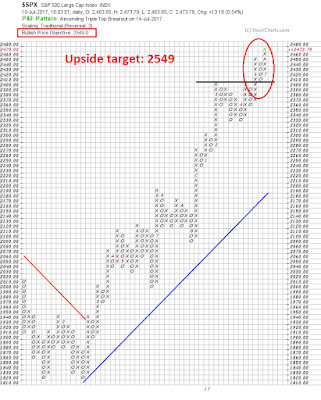 Using the point and figure charting tool at stockcharts, I get an upside target of 2549 for the SPX with a traditional box size and 3 point reversal. 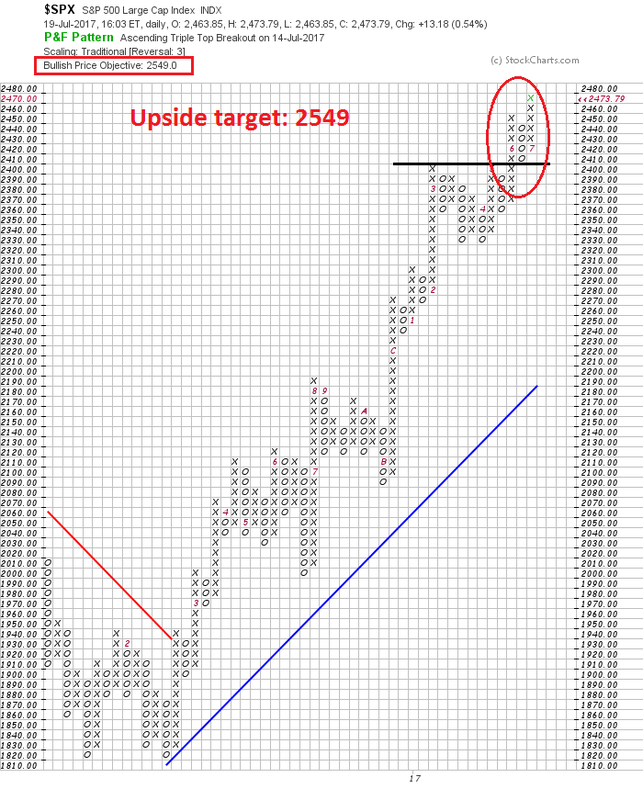 If I vary the parameters to a 1% box size and a 3 point reversal, the upside target is 2524. The difference seems to be the width of the consolidation pattern and the site of the upside breakout. 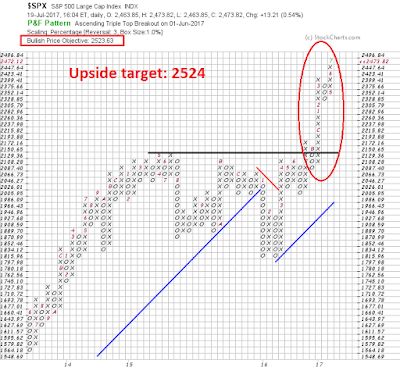 Is the target 2524 or 2549? What gives? US bond yields began to settle down last week when Fed Chair Janet Yellen stated in her Congressional testimony that the neutral rate for Fed Funds is roughly the inflation rate, which is much lower than market expectations. In addition, she allowed that the Fed is likely to re-evaluate its tightening path in light of tame inflation figures. Once that [normalization] process begins, I will want to assess the inflation process closely before making a determination on further adjustments to the federal funds rate in light of the recent softness in core PCE (personal consumption expenditures) inflation...I will want to monitor inflation developments carefully, and to move cautiously on further increases in the federal funds rate, so as to help guide inflation back up around our symmetric target. The June CPI print came in below expectations, which reinforced the view that low inflation releases may prompt a shallower path for rate hikes in 2017 and 2018. Brainard stated on Thursday, before the CPI release, "I don’t think anybody can give a fully satisfactory answer to why we’re seeing the inflation trajectory that we see today." In the past, we have seen inflationary surges whenever the unemployment rate falls substantially below 5%. 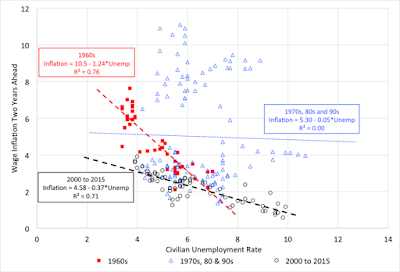 The graph below depicts the unemployment rate (blue line, with the zero level set at 5%), with CPI (red line). The rise in inflation has been quite tame by historical standards, which is creating a dilemma for policy makers. The Fed's underlying model of inflation is the Phillips Curve, which posits a trade-off between inflation and unemployment. 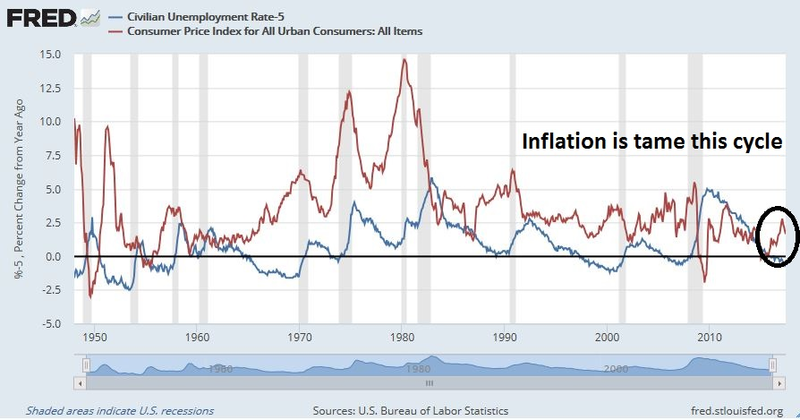 As the chart from this Money and Banking primer shows, the inverse relationship between inflation and unemployment has been flattening since 2000. Falling unemployment should drive up wages, which is the price of labor, and put upward pressure on inflation. This time, the wage and inflation response has been muted. Questions are being asked at the Fed. 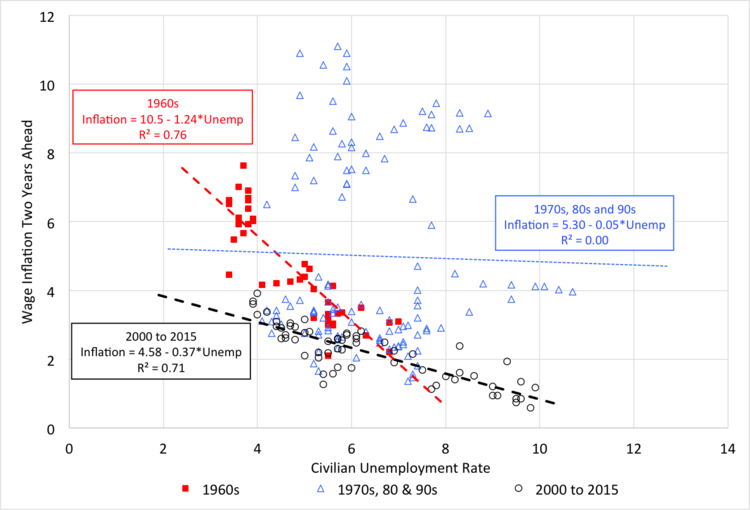 Is the Phillips Curve broken? Why aren't wages rising? (1) Everyone around you is talking about stocks (or real estate or whatever the fad asset of the day is). And you should really start worrying when the people talking about getting rich in certain areas of the market don’t have a background in finance. (2) When people begin quitting their jobs to day trade or become a mortgage broker. (3) When someone exhibits skepticism about the prospects for stocks and people don’t just disagree with them, but they do so vehemently and tell them they’re an idiot for not understanding things. (4) When you start to see extreme predictions. The example Bernstein gives is how the best-selling investment book in 1999 was Dow 36,000. He said he’s not worried about a bubble at the moment but seeing 3 out of these 4 conditions being met would be a warning sign. Despite my series on investor sentiment, Things you don't see at see at market bottoms (which had four editions that were published 13-Jul-2017, 7-Jul-2017, 29-Jun-2017, and 23-Jun-2017), market psychology has not reached the "OMG I have to quit my job/mortgage the house to buy/trade the hot asset of the day". 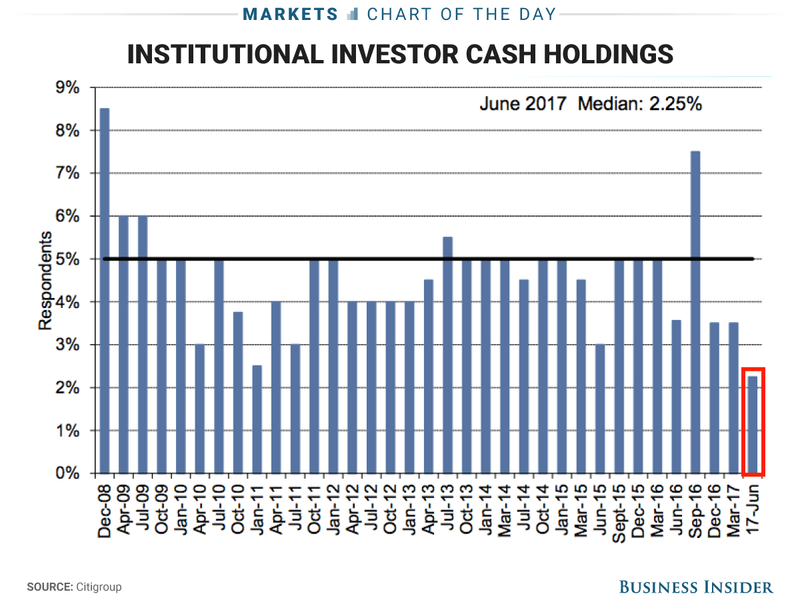 While there are some excesses, such low levels of institutional cash (chart via Business Insider), the lack of over-the-top froth suggests that the next stock market downturn from a recession may be relatively mild in the manner of a 10-20% decline seen in the 1990 bear market. While I am somewhat sympathetic to that view, investors who are looking for signs of froth are looking in the wrong places. One of the processes that occur in recessions the correction of excesses in the past expansion. Most of the real excesses are not to be found within US borders, but abroad. 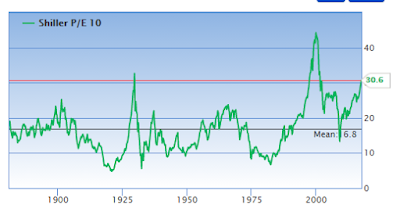 I have stated that while I don't believe that the stock market has made its final cyclical top, we are in the late stages of a bull market (see Risks are rising, but THE TOP is still ahead and Nearing the terminal phase of this equity bull). Nevertheless, psychology is getting a little frothy, which represent the pre-condition for a major top. As a result, this is another post in an occasional series of lists of "things you don't see at market bottoms". This week, I focus on more signs of retail giddiness. Mid-week market update: Having reviewed sector rotation last week (see More evidence of an emerging reflationary rebound), it is time to apply the same analysis to countries and regions. First, let's start with a primer of our analytic tool. Relative Rotation Graphs, or RRG charts, are a way of depicting the changes in leadership in different groups, such as sectors, countries or regions, or market factors. The charts are organized into four quadrants. The typical group rotation pattern occurs in a clockwise fashion. Leading groups (top right) deteriorate to weakening groups (bottom right), which then rotates to lagging groups (bottom left), which changes to improving groups (top left), and finally completes the cycle by improving to leading groups (top right) again. Here is the RRG chart of the major countries and regions of the world. All ETFs are priced in USD and therefore all currency effects are already part of the returns. The rotation analysis was performed relative to MSCI All-Country World Index (ACWI). My interpretation of the RRG chart indicates that US stocks are poised to take the leadership position again, after a brief hiatus. Emerging leadership can also be found in the resource producing countries of the world, such as Australia, Canada, Latin America, and Russia. European and Asian stocks, which had been the leaders, are starting to consolidate and they are likely to begin to weaken on a relative basis. 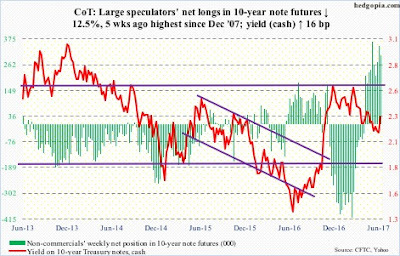 These patterns are consistent with my thesis of a developing reflationary blow-off equity market top. Are stocks being stalked by a silent Zombie Apocalypse? 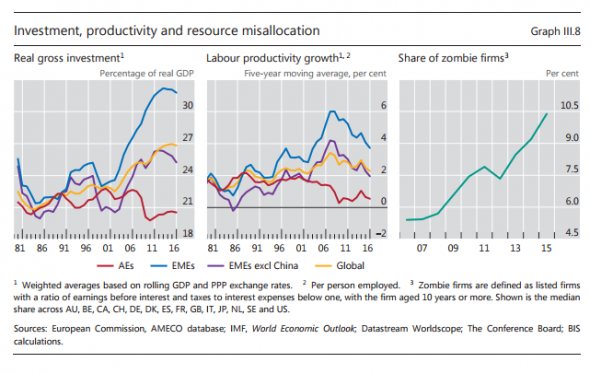 There was some minor buzz on the internet when Jonathan Tepper tweeted the following BIS chart and rhetorically asked if zombie firms was the cause of falling productivity during this expansion. BIS defines a "zombie" firm as a company that has been listed for 10 years or more and has an EBIT interest coverage of less than 1. 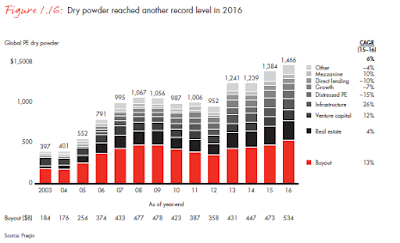 As the charts show, the number of "zombie" companies have been rising steadily, while advanced economy (AE) productivity and CapEx has been muted during this expansion. 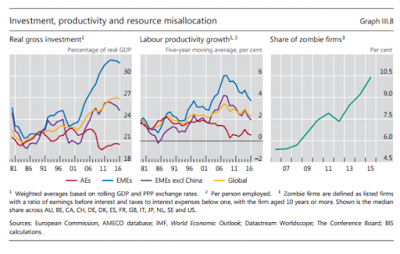 While the zombie hypothesis has much intuitive appeal, especially to the permabear and doomster set, a deeper examination reveals some unanswered questions that casts doubt about this explanation for the muted productivity gains of this cycle. 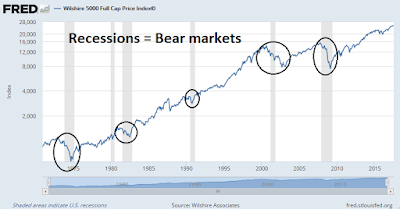 What is the risk of recession? The entire article reads like a laundry list of points that would make sense to investors with limited knowledge of economics. That is why I am disappointed. My hope is that top journalists would help explain reality rather than feed fears stoked by so many others. This article will frighten investors. Is that what the author intends? 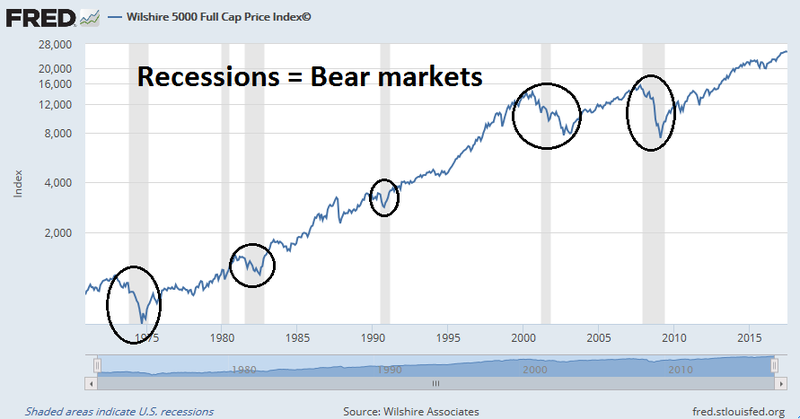 The issue of recession risk is important to investors because every recession has been accompanied by an equity bear market. So let me put in my two cents worth in my own assessment of recession risk for the American economy. As a result, this is another post in an occasional series of lists of "things you don't see at market bottoms". This week, I focus on the theme of further signs of the bullish bandwagon. 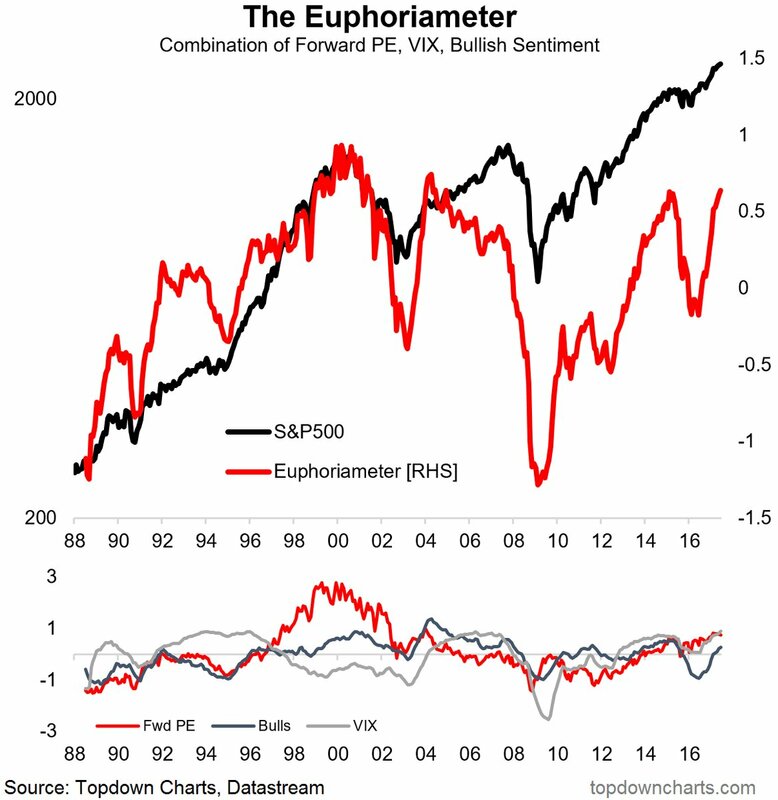 To summarize, Callum Thomas of Topdown Charts constructed a Euphoriameter, consisting of forward P/E, VIX (inverted), and bullish sentiment. Readings are highly elevated, though they have not reached the highs seen at the last cycle top. Mid-week market update: Further to my last post (see Nearing the terminal phase of this equity bull), There are numerous signs that the market's animal spirits are getting set for a reflationary stock market rally. 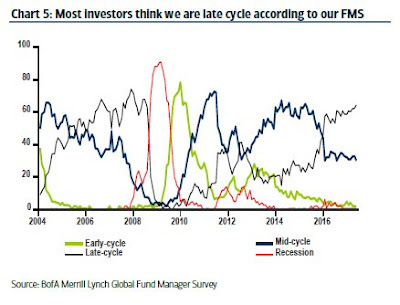 First of all, the BAML Fund Manager Survey shows that a predominant majority of institutional managers believe that we are in the late cycle phase of an expansion. Even as the recent SPX stays in a narrow trading range, there was plenty of pain to go around beneath the surface. The drubbing taken by NASDAQ stocks were largely offset by rallies in Financials and Healthcare. So what are the next pain trades, and what are the implications? Hedgopia documented how large speculators (read: hedge funds) have moved from a crowded short in the 10-year Treasury Note to a crowded long. 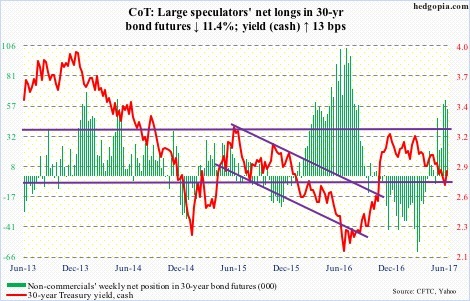 Similarly, large speculators are also in a crowded long in the T-Bond futures. 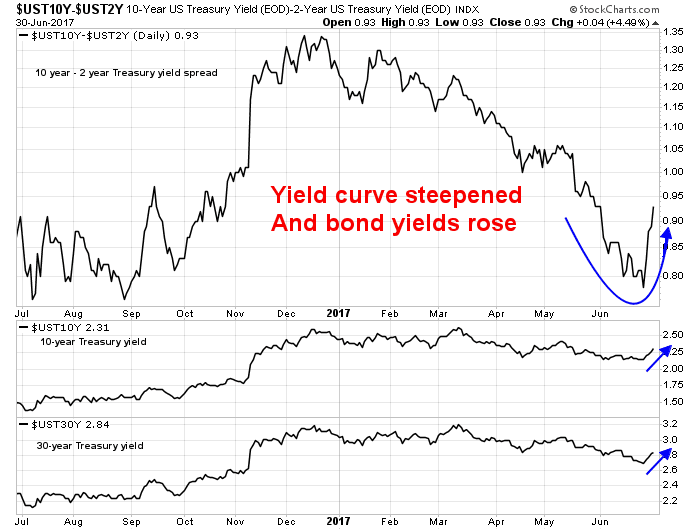 Bond yields began to rise, and the yield curve steepened dramatically. Those are the first major pain points for traders. These dramatic reversals have further implications for the equity market.